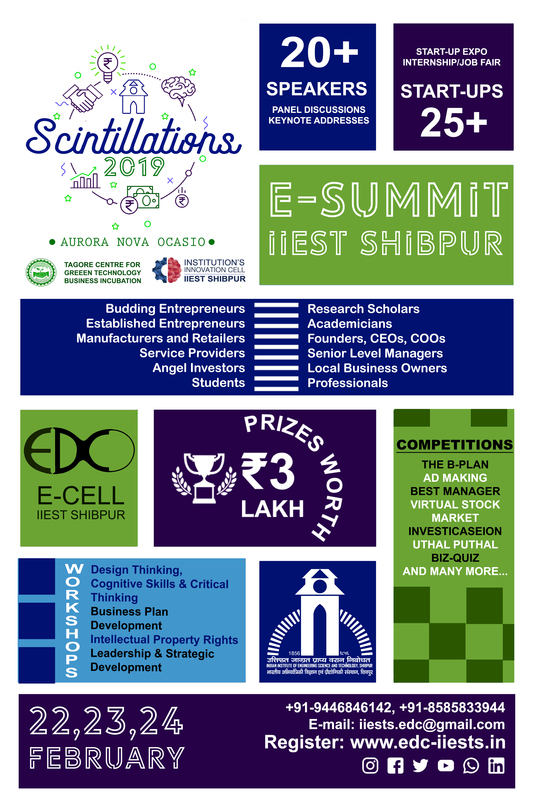 The annual E- Summit of Indian Institute of Engineering Science and Technology, Shibpur (the second oldest college in India, established in 1856) organised by Entrepreneurship Development Cell, IIEST Shibpur with an aim of inculcating the spirit of entrepreneurship in individuals. The event will include Competitions, Panel Discussions, Workshops, Expos, Internship and Job Fair. It brings together the academic community, venture capitalists, new age entrepreneurs and all those passionate about entrepreneurship to a common ground. The focus of the summit remains to cater to the leadership qualities in an individual and stimulate him into unleashing his innovative streak. Providing an open platform for everyone to interact with eminent personalities like Saras Sagar, Ankit Prasad, etc. The three days event will be full of learning, personality development and exposure to the corporate world. Students from any course can register at this page. For updates, follow the below pages.